Nestling in the tranquil countryside of Ruimsig, west of Johannesburg, lies one of South Africa's most challenging championship golf courses, Roodepoort Country Club. It is well known and recognised that condition-wise the course is consistently among the top 10 in South Africa. The rolling bent grass greens are spectacular and similar to those that the world's top professionals encounter on the United States Tour. There are 72 bunkers to contend with and seven water hazards offering all handicap golfers a challenge yet the good golf shot will always be rewarded. Roodepoort Country Club was designed by Gary Player and Ron Kirby and is renowned for it's large, undulating Bent grass greens with subtle slopes. It is a well bunkered, inland links course with well defined fairways - a great test of golfing ability for both high and low handicap golfers. 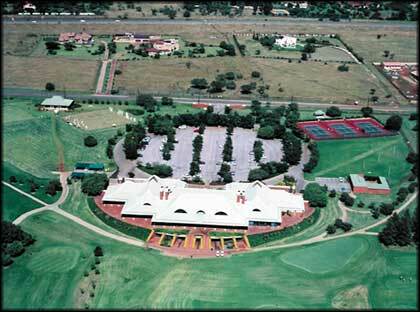 Roodepoort Country Club boasts some of the best facilities in the country. We offer the golfer and non golfer great options. At Roodepoort Country Club we are very proud of our club house facilities. Our spectacular club house with a huge colonial verandah offers the golfer and visitor the opportunity to sip an ice cold refreshing drink whilst watching the golfers come in. wedding and party facilities for 30-350 people. • Must be smart casual. • No shorts with elastic waist. • No shorts with lace tie ups. • Must wear a belt if shorts have belt loops. • Short socks (predominantly white - no peds) or long socks with bermudas. • Golf footwear with socks only. • No takkies allowed. SOFT SPIKES ONLY. • Short socks (predominantly white - no peds) with Bermuda shorts. • Must have collar and sleeves. • Must be four fingers above knee. In order to avoid embarrassment, members and guests are required to conform to the above. Management reserves the right of discretion regarding ones dress.